Advance MFF 100% Whey Protein is Premium protein providing more protein from Whey Protein Isolate as compared to MFF 100% whey protein. Whey Protein isolate with added lasted technology enzymes helps in much faster digestion and absorption of protein and other nutrients. The protein is designed keeping in mind the advance fitness goals which require not only more protein, faster digestion but also better recovery with added 22 important vitamins and minerals. This protein will help you achieve your advance fitness goals in much better way and prepares you to train better. Advance Protein for better results. Highly Low in fat and carbohydrate. Contains no Sugar & Aspartame. Product Authentication through SMS or Website:- Now through SMS or on MyFitFuel website you can Authenticate every MyFitFuel Nutrition Product with Authentication Scratch codes give on the bottom of our Products. 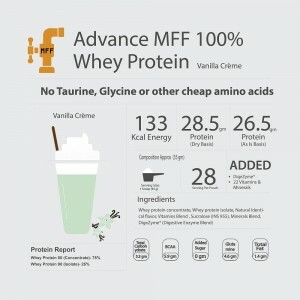 What is Advance MFF 100% Whey Protein? Advance MFF 100% whey protein is made with greater understanding of protein ratio of whey protein Isolate and Whey Protein Concentrate which could help you achieve better results. Our research determined that there could be an advance blend which could help not only provide much faster digestion and absorption but at more competitive price. So as to make the results much better we combined the protein blend with latest Digestive Enzymes technology Digezyme® and an important combination of 22 Vitamins and Minerals which individually provides greater benefit to your workout. Benefit of Advance MFF 100% Whey Protein with 25:75 Ratio Blend. 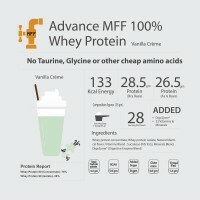 Advance MFF 100% Whey Protein unique value to our customers helping them achieve better results at better pricing. There are multiple benefits of this product, few including. - More Whey Protein Isolate which provide more protein per scoop. - Added Digezyme® advance latest Digestive Enzymes Technology. - Much faster digestion and absorption due to more source Whey Protein Isolate along with advance digestive enzymes. - Enhanced Protein Synthesis due to high source of naturally occurring BCAA which helps to increase quality muscle mass. - Very low in carbohydrate and fat and helps in Lean muscle growth. - No added sugar and No Aspartame, No Dairy whitener, No Soy Protein, Skimmed Milk powder. - High source of naturally occurring BCAA for better protein synthesis. - 28.5 gm Protein on “Dry Basis”. - 26.5 gm Protein on “As is” Basis. - 26.5 gm Protein on “Dry Basis”. 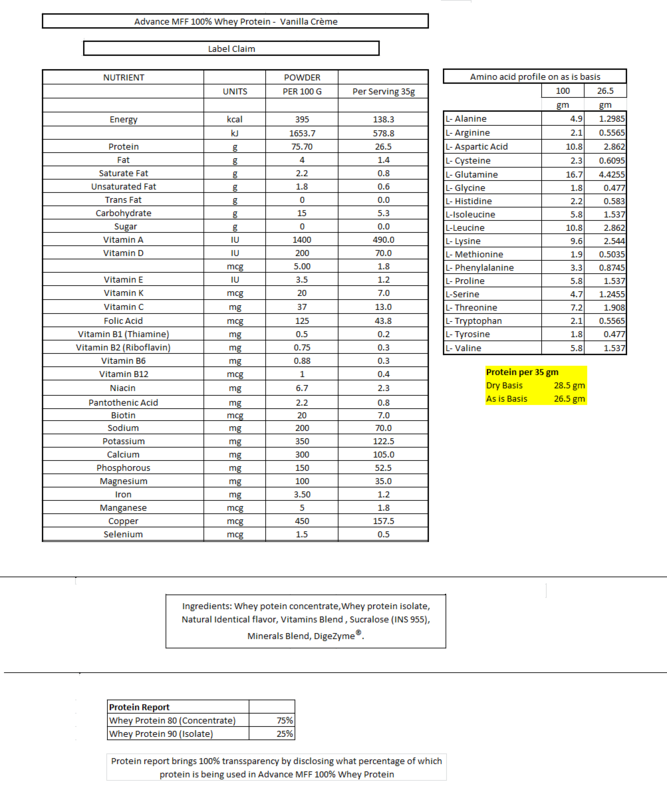 - 24.8 gm Protein on “As is” Basis. Advance MFF 100% Whey Protein is made with high control over the carbohydrate and fat in every scoop of protein. With higher amount of Whey Protein isolate it reduces the overall carbohydrate as Whey Protein isolate is made up of 90% whey Protein i.e every 100 gm protein contains 90 gm protein and almost negligible level of carbohydrate and fat. Low level of carbohydrate and fat helps to increase the muscle mass without increasing the bulkiness through fat making you look fit, strong and sharp. Digezyme® are not just the general digestive Enzymes. They are made up of unique and researched combination of Gluten Free & GMO Free Multi Enzyme Blend including amylase, lactase, cellulase, lipase and protease. Digezyme® not only helps removing the bloated feeling and better digestion but also helps by making sure that the overall consumed protein content gets absorbed more quickly in muscles so as to get quick benefits and better utilization. The requirement of Vitamins and minerals increases as we workout and they play very important in helping you achieve better fitness level. They are considered essential nutrients as they play hundreds of important role in the body. Increase in workout increase the requirement of getting oxygen to tissues, energy production from carbohydrate and fat, protecting from infections and damage to body cells, etc. There are many such important roles which vitamins and minerals help to improve the overall workout and fitness. Vitamins and Minerals added in Advance MFF Whey Protein 80 have gone through many stages of research to understand the body requirement during different stages of workout. Educating our customers is always our priority. 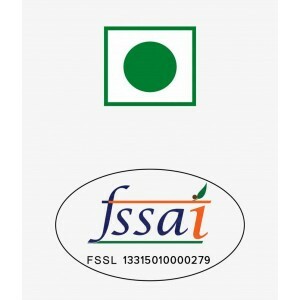 As in Indian Sports & Fitness Nutrition market we were the first one to bring 100% Transparency and in similar way we are the first to bring better education for our customer when it comes to difference between Protein calculations on “Dry basis” vs “As Is Basis”. What makes MFF 100% Whey Protein™ the best whey protein blend in India? 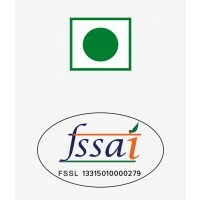 Quality- We never compromise in quality of our products and our products quality is what we bet on. Consistency- Consistency in the quality is very important for us. We take every measure from beginning to end to provide you the same nutrition quality and whey protein blend taste every time. Transparency- We believe it’s your right to learn about the products actual benefits and its worth before you buy Advance MFF 100% Whey Protein online in India. Many companies never disclose right percentage of protein used in the product, helping them to hide the actual worth and benefits of the product.We provide complete information in our “Protein Insight” by telling you which protein we use before you buy 100% Whey Protein advance from us. Our transparency also helps you to always know the price you are paying us is it the right Advance MFF 80% whey protein concentrate price. We recommend 2-5 servings of Advance MFF 100% Whey Protein™ daily to complete your protein intake. To promote lean muscles in your body, expert suggests 1g of protein per pound body weight everyday (2.2g per kg of body weight everyday) consumed during different time of the day. Some train in morning and some in evening but we recommend following important serving times of Advance MFF 100% whey protein. --> Any other time during the day or in between meals when you require additional protein intake. Benefits of taking with Water- Taking Advance MFF 100% Whey Protein™ with water helps you to get Lean Muscles as it reduces the overall calorie intake from your protein shake in comparison to milk. Protein shake in water is also recommended to any individual following the weight loss programme with restricted calories intake. Benefits of taking with toned or double toned milk- Adding milk with protein add calories. It helps to make the shake creamier and thicker. But 250 ml of toned milk will also add approx 150 extra calories in every shake. So, if you are looking to bulk up or to increase weight then taking protein shake with milk will always be recommended. Ingredients: Whey potein concentrate,Whey protein isolates , Natural Identical flavors, Vitamins Blend , Sucralose (INS 955), Minerals, DigeZyme®. Although we have written detailed Protein research here - Protein University . There are still few small question we summarized. 1). How is Advance MFF 100% Whey Protein™ different from MFF 100% Whey Protein™? Advance MFF 100% Whey Protein contains more Whey Protein Isolate than MFF 100% Whey Protein as there is more Whey Protein isolate added. It is designed to help you provide better digestion and absorption of protein. It is added latest advance enzymes technology (Digezyme®) which helps in better absorption of nutrients providing better benefit. Advance variant also contains 22 important Vitamins and Minerals which helps in better recovery by fulfilling all the required minerals and vitamins in the body. The need of these vitamins and minerals increases when we workout. Whereas MFF 100% Whey Protein is made up of just pure whey protein Isolate and whey protein concentrate 80%. 2). What does Advance MFF 100% Whey Protein™ actually do? Every scoop of advance 100% whey protein high source of fast digesting protein which helps different sports players, athletes, and bodybuilders to continuously repair broken muscle tissues and grow them. This advance product with added latest technology enzymes helps in faster digestion, absorption and better recovery of the muscles specially during post workout period. 3). When Should I take Advance MFF 100% Whey Protein™? The actual timing of taking protein totally depends on the lifestyle and the fitness goals of an individual. Few people like to train in the morning and few people like to train in the evening but we always recommend following important serving times of Advance MFF 100% whey protein. Immediately upon waking up in morning. Immediately after you work out i.e post workout. Or any other time during the day or in between meals when you require additional protein intake. 4). Why should I even take protein? Our muscle is made up of protein. Protein naturally plays very important role in our body for repair and re-growth of your muscles tissues. If we keep this in very simple words, so as to keep our muscles strong, increase the muscle mass strength for athletes, bodybuilders or any individual into any fitness activity, we need protein. Training endurance athletes also need the right amount of protein for muscular repair. Ultimately all bodybuilders, athlete, and individuals into fitness need protein to help them cope with the continuous demands of heavy training and growing competition. Weak muscle will lead to lower strength and poor results. 5). Is Advance MFF 100% Whey Protein™ suitable for vegetarians? Whey protein naturally is made from pure milk and it is considered as a vegetarian source of protein. So Advance MFF 100% Whey Protein is 100% Vegetarian. 6). How can I tell if protein I am using is of good quality or not? Many companies declare in label something different from what’s actually there inside their packet. MyFitFuel is very particular about its quality. 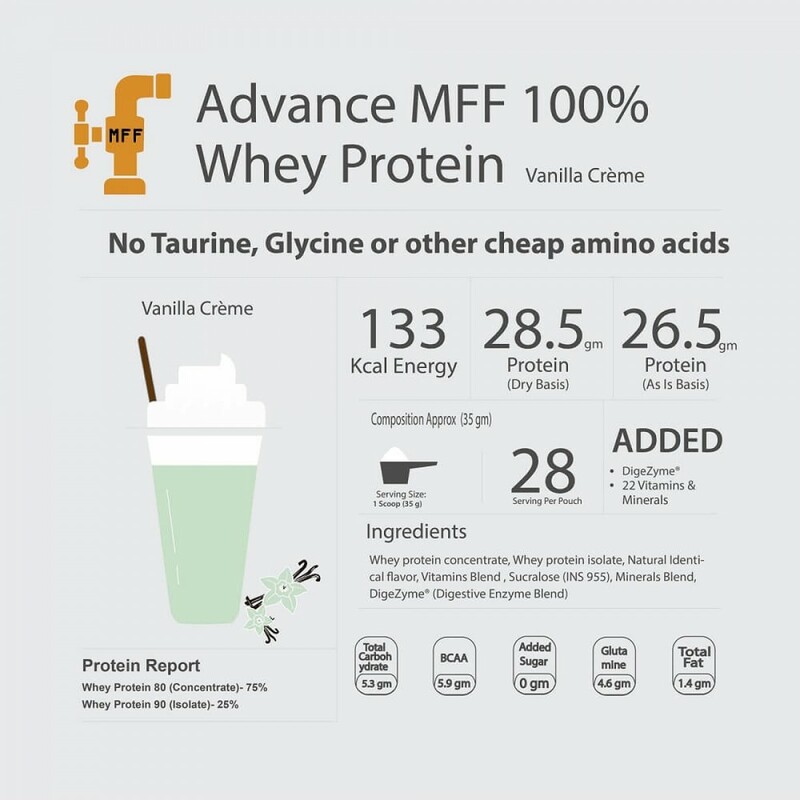 In our “Protein Report” Section on Advance MFF 100% Whey Protein product page we always declare which proteins are used in this product (i.e nothing hidden). One of the basic and important key sign which everyone should look for is the level of protein declared on the label. We are also the first one to bring better education for the customers about Protein calculations on Dry Basis vs As is Basis. Protein should be easy to mix and with little froth. And yes of course, another ultimate way to know is from the results you get from taking the product for some time. 7). Can I take Advance MFF 100% Whey Protein™ with any other supplement? Yes, you can take Advance MFF 100% Whey Protein with any other supplement. It can help you increase your workout benefit when you take it with most commonly used supplements with whey like MFF Creatine Monohydrate 200 Mesh, MFF BCAA 5000 (2:1:1) (Branched Chain Amino Acids) and MFF Pure Glutamine. It is always recommended you to check the serving instructions on each additional product you plan to take as a combination with this MyFitFuel product. 8). How do I make a perfect whey protein shake with Advance MFF 100% Whey Protein™? It is very easy to make a perfect shake from Advance MFF 100% Whey Protein. Please follow few simple steps. Take good blender like MyFitFuel MFF™ Blender, pour approx. 200-250ml of liquid in the blender first. (Less the liquid thicket will be the shake). Adding milk will help you to bring creamier shake but adding water will help you to avoid intake of extra calories and fat that comes from milk. For next step, pour a scoop of Advance MFF 100% Whey Protein into the liquid and shake it for 15-20 seconds. Its ready to consume. 9). What effects should I expect from taking Advance MFF 100% Whey protein during my daily training routine? Advance MFF 100% Whey Protein is uniquely designed for better results with more protein, faster digestion with advance technology enzymes and 22 important vitamins and minerals. It provides a very high level of fast digesting protein percentage in every scoop you consume. Results of talking protein vary for every individual which totally depends on individual sports and fitness goals, body type, diet, nutrition, and training. For an athlete, bodybuilder or individuals into fitness it can help to reduce the muscle breakdown, repair broken muscles tissues faster after post workout, improve workout recovery time. 10). Who should take benefits from taking Advance MFF 100% Whey Protein™? MyFitFuel products are meant for every individual who is looking for high-quality protein for completing their daily protein diet, any one into any fitness activity, sports, or bodybuilding. We always keep our product information very transparent that customers can completely learn about every product before buying them. Any one below in this category can take this product. 11). How much Advance MFF 100% Whey Protein™ should I take? 12). What are the side effects of taking Advance MFF 100% Whey Protein™? 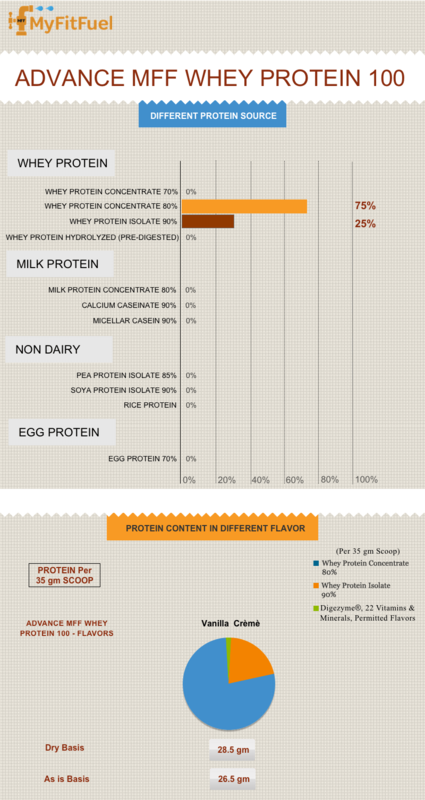 Protein source in Advance MFF 100% Whey Protein is purely from milk. There are no side effects from taking Whey protein that we have heard of until now or found any research on it. If you are not restricted to any dairy products or not allergic to dairy proteins due to any medical reasons, then consuming it should be fine for you. Please do consult your doctor before consuming any kind of whey protein, if you are allergic to dairy proteins. We also never recommend taking it as the sole nutrition for your body and skipping the meals completely. You can make a good balance of meals and our protein made from pure milk and consume it regularly until required. 13). Is there any artificial color or flavor used in your flavored product variant of Advance MFF 100% Whey Protein™? No, there is no artificial color flavor added in this product. In fact, we don’t even use Aspartame as a sweetener. First had it with milk and it tasted horrible! Next had with water and it was better. More water the better, reduces the sweetener's effect. I'm not a fan of artificial sweetener because of the chemical aftertaste. I prefer Unflavored supplements. Also, this powder causes bloating. You'll be passing gas the whole day. Didn't have any issues with MFF Whey Protein 90 Isolate™(Unflavored). 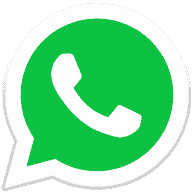 It is a very good product in all aspects.